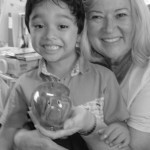 Hello from the OC Childhood Language Center where we remain focused on helping children become strong communicators. The CLC reopened on September 25th after the summer break. The reopening was delayed due to some water damage caused by a leaky pipe in the upstairs unit. The building owners worked closely with the CLC to assess the damage and quickly repair the center, so the children could return. Everyone is excited to have the children back at CLC, so they could continue the journey to becoming strong communicators. We are so grateful for our new friend Melody for all the help and supports she has provided during this time. We have over 50 children enrolled at the CLC and are scheduling evaluations to see who else can benefit from our award winning services. 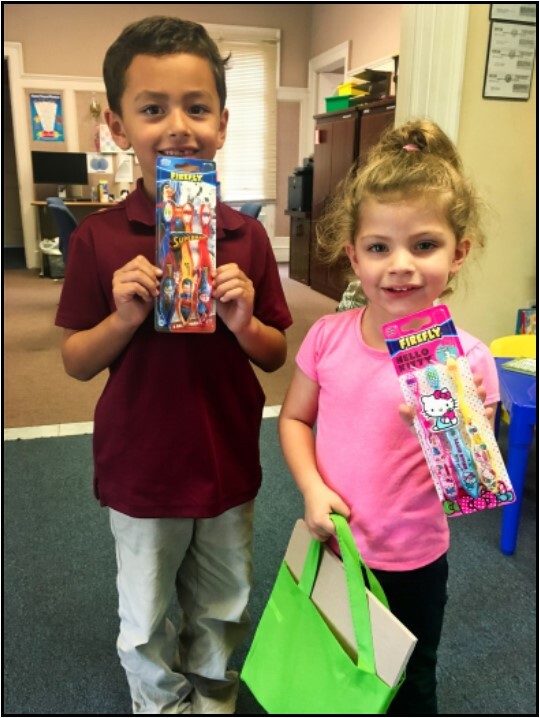 Happy children display their new dental hygiene products (toothbrushes, in this case); gifts from the Orange County Childhood Language Center. It has become a tradition for Honorable Frankie Rosario 32° KCCH and his wife Cristi Shinn to provide backpacks and school supplies to the children at the CLC. They generously search for just the right items that are needed to start the school year right. This year Frankie & Cristi took this effort to a new level by adding dental hygiene supplies to the list. Brother Frankie has learned that some families need help with basic dental hygiene supplies that can promote good oral health. The American Dental Association recommends everyone should brush their teeth twice a day with a fluoride toothpaste, a cleaning between your teeth once a day with floss and replacing your toothbrush every three or four months. We look forward to bringing more great news to you from our CLC in the coming months. Hello from the OC Childhood Language Center. After a well-deserved break, the center is once again open and ready to provide services. Preparing for this process requires coordination between the supervi-sors and the staff. At the center, we love when the phone rings because we know that with every call we are one step closer to helping a child overcome their speech challenges. With the start of the new school year at Chap-man University, we welcomed back “seasoned” SLP supervisors and Graduate students who will be con-ducting therapy sessions and evaluations. Our children are also happy to come back, as they love their clinicians and know they will receive the help they need to improve their speech. We are thrilled to report that our ongoing contributor has once again committed to providing the Language Center with backpacks and all the age appropriate school supplies required to help kids whose family are unable to afford these expenses. We are certain that the children being helped will benefit greatly from receiving these backpacks full of supplies. Please stand by for pictures of our children receiving their gift next month. Reading aloud is a critical tool in language development that takes place even before a child can talk. Hearing sound to word connections and word to picture relationships helps the language and thinking areas of the brain to develop. It also builds a bond of fun, curiosity, and motivation between the child and their parents, grandparents and other reading partners. Children who are read to hear new words and build both the understanding of word meanings and the ability to use words themselves. You may not see the immediate effect, but research shows that long-term results in language development and reading skills are evidenced. At the Orange County Childhood Language Center, reading books is an important part of therapy and enjoyment between children and their student clinicians. Reading and literacy skills significantly aid in communication. When you can spell, you can communicate freely. Teaching these essential skills at the Center is key to better communication. Appropriate pragmatic/social skills are also a key component to interacting with others in their community and life. When you have limited, or have no function-al speech, pragmatic language skills are often significantly delayed and disordered. As humans, we communicate with a total communication approach. We communicate via speech, facial expressions, gestures, eye contact, writing, typing and many other forms of communication. Our speech language pathologists often teach our clients how to communicate in other ways, all to increase confidence and with time, allow our kids to overcome their challenge and graduate from our pro-gram. At the Center we receive donations for sup-plies, water, etc., but you should know that we are also very appreciative of your financial contributions, as it keeps the center open and providing services to our children. Please remember, our duty is to provide those without a voice, a way to communicate, so please help us bring the gift of voice to our children. The following Brethren have sent donations to the Santa Ana Childhood Language Center with their 2013 dues. We thank you for your kindness and dedication. Thanks to your generous contributions, we were able to provide each child attending the Language Center with a very nice backpack, full of the “right” grade-appropriate supplies to help them thrive academically. My personal thanks to Venerable Master, brother Bob McNamara, Asst. Personal Representative, Illustrious brother Rich-ard Wood, Illustrious brother Wayne Butterbo, brothers David Frias and family, Andrew Todd, Daniel Willerton, James McCallion, Jamie Hopkins, Daren Gress, Jim Nyfer, Thomas Olsen, and my extraordinary wife, for their generosity and support. The “stuff the backpack” event held at our home was a total success! Together we assembled 56 backpacks, which were formally presented to the Language Center on Thursday August 30th. As you can see, our children received their Rite Backpacks with great smiles! I would like to share with you some of the statements made by our children and their families, in a beautiful book presented to the Scottish Rite during our Language Center appreciation dinner, which took place on Monday October 1st, at the DeMolay Center in Anaheim. We are so thankful for your donation! Thank you so much. We really enjoyed the use of the school supplies. It was enough to share among my sister and brother. Scottish Rite, Valley of Santa Ana, thank you for your kindness and generosity. Katie was thrilled to receive one of the your Operation Backpacks. It truly made her feel special. There are so many school supplies to keep her love of learning thriving for a very long time. Here smile says it all! Thank you again for your kindness and generosity. My family and I would just like to take a moment and thank you for your generous donation. My daughter Rachel was able to receive a beautiful backpack for school thanks to your generous donations. She was in desperate need for one as school recently started but we were unable to provide one for her. Once again, we give our heart-felt and sincere thank you for your philanthropy. Brothers, this is the impact we make in the lives of our children. The Language Center is our Philanthropy, so let’s continue our work, as after all, this is what masons know how to do best! If you missed out on this great opportunity, get ready, Operation The Rite Christmas is coming next! As I mentioned earlier, the “Rite” is here to stay! Just a quick word to thank everyone who participated in the Operation The Rite Christmas’s event for your generosity and time. The event hosted on Saturday November 17th was a total success! Together we wrapped over 60 gifts for the children of the Language Center, so Mr. Santa Claus could distribute them on Monday December 3rd, during the Scottish Rite Holiday Dinner. We are certain these gifts will uplift the spirits of every child attending the Language Center during this very special holiday season. Once gain, thank you for being part of this very special event and for making a difference in the life of our Language Center children. Once gain, thank you for being part of this very special event and for making a difference in the life of our Language Center children. If you missed this event don’t worry, another “Rite” operation will come soon! As I say, the Rite is here to stay! 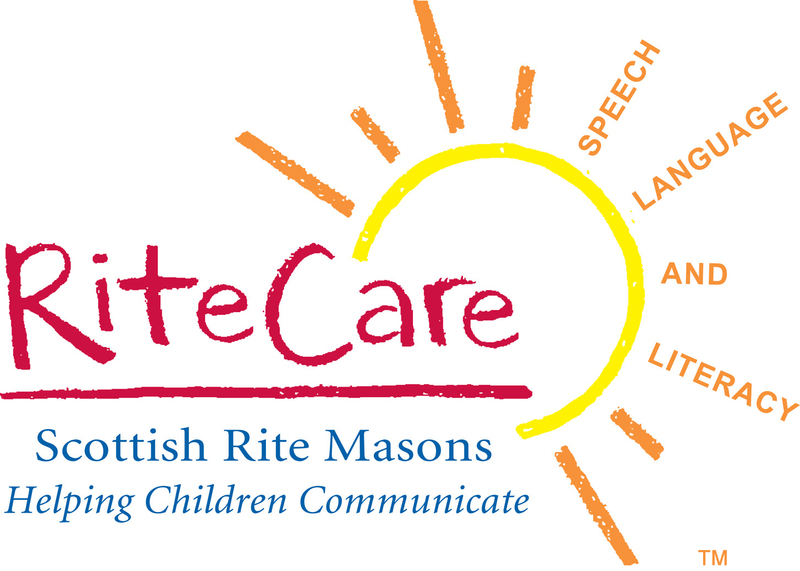 Santa Ana Scottish Rite – Making a Difference in the Community! Helping Children Communicate! We had some very rewarding and successful projects this Fall. Many thanks to Frankie Rosario and his team who managed this daunting shopping and stuffing task and it’s personal delivery! Halloween – brought many princesses, fairies, pirates, and ghosts to our Center. The happy faces of our children and their parents dressed in their costumes brought many smiles, candy and photo ops – espe-cially with our well-dressed staff. Trick or Treat and Happy Halloween are not easy to say – but some parents heard it for the first time! Center supporters and Board members organized and held a fun and successful golf tournament. For golfers and friends, there is good fun and good cheer after the tournament. The bountiful buffet dinner was delicious. The raffle was great fun. The donated prizes were a reflection of the long hours put in by volunteers canvassing our communities and businesses. If you were not able to participate this time, put it on your calendar for next year. And… our anonymous donor made it possible to continue our mission. Thank you! Thank you! Our family Holiday Dinner and Santa visit (with bake sale and raffle) will be a night of wonderment and awe for our children and their families. Several families have made new friends as they wait for their children. We encourage our children to “use their words” of polite social language as they meet each other. 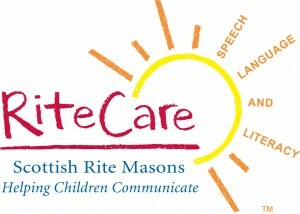 We all know that the Language Center is our Scottish Rite Philanthropy. I’m sure you also know that the major source of funding for the Center is our Annual Scottish Rite Golf Tournament, which is coming up again this October! 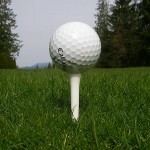 The Tournament will be held October 29, 2012, at Aliso Viejo Golf Club, and will be the same format as in previous years – a shotgun start, scramble (best ball) tournament. As always, there will be plenty of prizes, and many opportunities to win great gifts! We do hear, each year, folks saying that can’t help because they don’t golf – but nothing could be further from the truth! Yes, you can help without golfing – come on down and help, volunteer, participate, meet the many guests. We have a great dinner afterward, and you can participate by attending that, and participating in the silent auction and opportunity drawing! So yes, you can be an important part of supporting our Center! Also, do you own a business? Have a friend who does? Do you do business with a business? Well, get them on board, to help support this important charity! We’ll have a number of participating restaurants, and we can always use more donors… so do your part and recruit supporters and sponsors, as well as golfers! We look forward to another fabulous tournament, and another great year for our Center! The “Barry the Pig” project for the Language Center headed by Dave Price, 32° KCCH is becoming very successful. So far, over a thousand dollars have been collected and deposited. It really is a simple concept. Everyone has change that they need to put somewhere and Berry the Pig is a perfect place. Our Language Center has Barry placed in many areas and the kids and their parents donate generously. The kids especially like to put coins in Barry to see his tail wag. 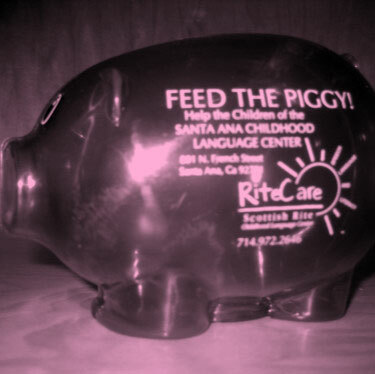 Two of our kids wanted to contribute to the Language Center as a thank you for their training and went home and emptied their personal piggy banks into Barry the Pig. They are Logan and Miguel and are pictured below. These two kids really gave all they had. We hope this will be an example to our Val-ley members to give some as the work the Language Center provides is exceptional. Allow me to introduce, Barry… the Pig. Barry is the new fundraiser of your Childhood Language Center. You can get your own Barry at the Scottish Rite Office (see Bros. Bill or Bob) or at our Stated Meetings (see Bro. Dave) just note your name, phone number and number of Pigs taken. Once Barry is full, just take him to the SR Office or Stated Meeting and exchange him for another. 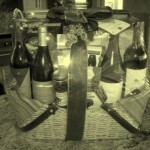 Upon each exchange of a full pig, you will receiv e an entry into a drawing for a beautiful gourmet gift basket. The basket contains various wines, cheeses, crackers, olives and other goodies. The more pigs filled and exchanged, the more opportunities to win. Barry, the Pig donations are tax deductible 501c(3). My Brothers, the 2012 Language Center “365” Club was off to a good start. We had five members that joined early in January. They are Neil Simmons, Peter Jantz, Ray Godeke, Bob McNamara and Don Tapia. This represents 20% of our goal of twenty-five members for 2012. However, since that time we have not had any additional members join. My Brothers, see if you can find it in your heart to join this important support group. The work that the Center does with young children is extremely important in their development as they learn to communicate and speak properly. That is a skill that most of us take for granted, but think for a minute if you had trouble communicating and speaking. It would make your life a lot harder. These are the skills that the Center imparts to their clients. This is our main Santa Ana Scottish Rite charity. Let’s support it! And remember it is tax deductible. Membership is $365 per year. Checks should be made out to California Scottish Rite Foundation (CSRF) with a memo Childhood Language Center of Santa Ana (CLC of SA). Thank you, my Brothers, for supporting this worthy cause.